A leaking roof can be devastating for you and your business. Luckily, we’ll always have your back when it comes to keeping you dry. 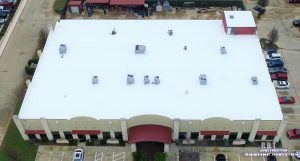 The professionals at R.B.T Construction Roofing Division are passionate about one thing and one thing only, that’s commercial roofs. Providing quality where it matters for over a decade, R.B.T Construction Roofing Division can help with PVC roofing installation in Texarkana, TX. So when you’re looking for that hometown company that cares about honesty and integrity give the experts at R.B.T Construction Roofing Division a call at 903-691-0931. PVC or polyvinyl chloride is a type of plastic that is used to create a waterproof seal over the top of the building. There are many advantages to using PVC over other roofing options. You might be asking yourself why should I use PVC? Energy efficient- Have you ever gone into a dark car in the middle of summer. Those dark colors just soak in all that heat making it as hot as a desert. One of the greatest things about PVC is that it is incredibly reflective. So you get to keep the heat out of your building and keep the money in your pocket. Flame resistant- It’s every business owners worst nightmare, you get a call in the middle of the night only to find out that your passion and greatest project is up in flames. Because PVC is flame resistant, you can rest just a little bit easier every night. Flexible- Do you have an awkwardly shaped building that you need to be covered? Polyvinyl chloride is great for buildings of all shapes and sizes, because of its flexibility and molding capabilities. Longevity- How long would you like for your roof to last? With PVC roofing you could easily have a roof that will last you and your business over 20 years. Here at R.B.T Construction Roofing Division, we have over a decade of experience where it matters and a passion for all things commercial roofing. We pride ourselves on honesty, and integrity and provide quality where it matters most. So if you’d like to learn more about PVC roofing installation in Texarkana, TX give us a call today at 903-691-0931. Updated on August 30, 2018 at 11:51 am by R.B.T. Construction Roofing Division.